It has been 300.000 kilometres (almost 200.000 miles) driving thru some of the worst roads of the world. We started in Barcelona, Spain, and we travelled the South of Europe, the Middle East and Africa from Cairo to the Cape. We crossed the Atlantic Ocean in a fishing vessel during 23 days and wandered slowly around all the American countries, from the Magellan Strait in Tierra del Fuego to the Arctic Ocean in Deadhorse and Inuvik. We've driven the PanAmerican Hwy., the Dalton, the Dempster, the TransAmazon and the Road 40 in Argentina. We had 4 bad breakdowns in places you wouldn't like to have any problem: in the Sudanese Sahara (at 270 km. of Khartoum), at Sibiloi National Park in Kenia (next to Lake Turkana, at 800 km. from Nairobi), a frozen engine in the Bolivian Altiplano and another breakdown in the deserted Chilean Andes. We had to fight in Trinidad and Tobago and Brazil, when someone put a knife in my neck, we've been robbed in Athens (Greece) and Addis Abeba (Ethiopia), assaulted with AK47 in Kenia and attacked with stones in Venezuela. 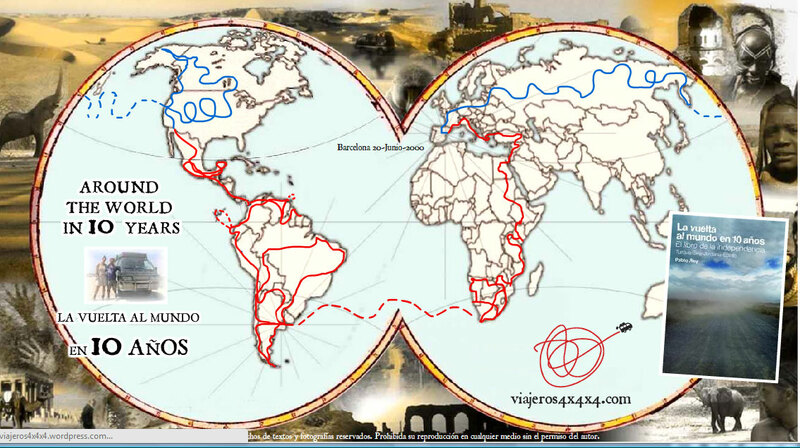 We have three books in spanish (you can find them in Amazon: Historias en Asia y África,[URL="http://www.amazon.com/s/ref=nb_sb_noss?url=search-alias%3Dstripbooks&field-keywords=la+vuelta+al+mundo+en+10+a%C3%B1os[/URL] El libro de la independencia y Por el mal camino[/URL]) and we just finished the translation into english of our book AROUND THE WORLD IN 10 YEARS: THE BOOK OF INDEPENDENCE. Thanks for posting. We all look forward to your updates as you continue your travels. It was so great to meet you guys at Overland Expo. You guys are an inspiration for all of us. I'm looking forward to reading your books. Safe journeys, wherever they may be! About our books, we can send them anywhere in the U.S. They are only in spanish for now... but they will fit great in any overlander collection! So, if anybody wants them just write us here or to viajeros4x4x4@yahoo.com. Its a good support so we can go on with this around the world trip! Un gran saludo de un compatriota Argentino, en San Francisco. I can't believe I missed you guys at the Expo. I remember finding your blog a while back and reading about your incredible story. I'd love to get a copy of your book. You guys take Paypal? We are greatly enjoying Pablo and Anna here at the offices. Great people and I love their attitude and passion for travel. Paypal sent. Looking forward to reading both! Yes, if you guys are around the Bay Area again, please do not hesitate to drop me a line. We are greatly enjoying Pablo and Anna here at the offices. I love their attitude and passion for travel. As someone asked the other day: After 11 years on the road, do you still enjoy travelling? Hey Anna, how is the alternator repair holding? I was thinking that because the plug on the alternator is so exposed to the road on your van, if you are only running the spade connectors instead of the original plug you may get road-salt and other grime up inside the plug area, which could cause some bad corrosion in there. Maybe you can make some sort of a "cork" to fit in there to keep the salt and grime out. Looks like you guys had some fun in the snow with Jeremy! We will try to cover it with something... cork, tape... whatever we will find in the car... or in the office!! And yes, we had a great time with Jeremy driving the jeep on the snow!! How was your way back home? Regards from Prescott, on a sunny and beautiful day!! Trip back was good. Much of the snow melted when I was away. It is less than 1 foot deep in my yard now.